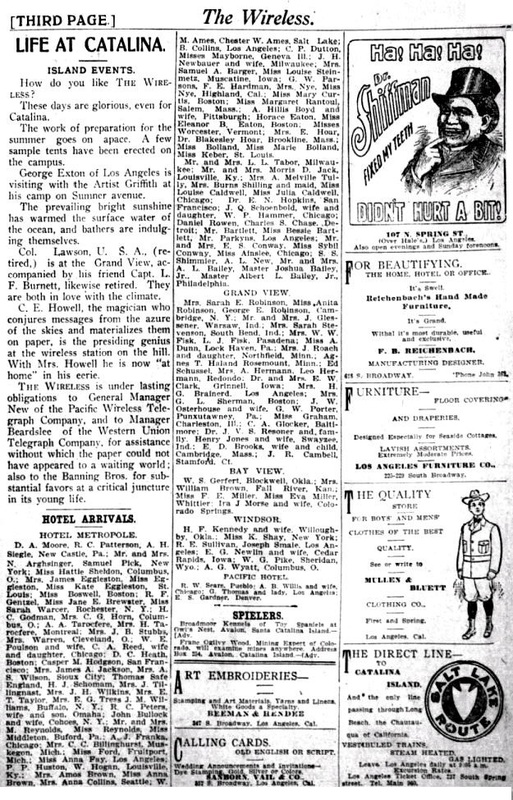 Two issues of The Wireless, the first daily newspaper in the world relying for its regular outside press report on space telegraphy, have been received by the Western Electrician. 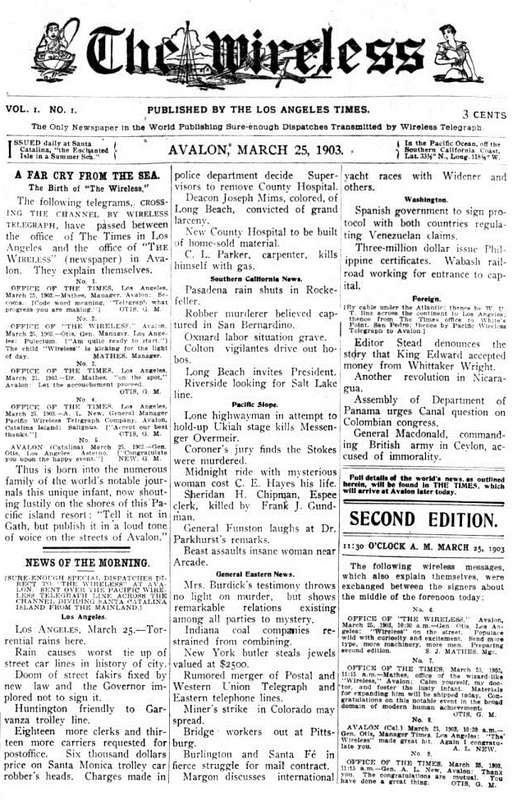 As heretofore stated, The Wireless is published at Avalon, Santa Catalina Island, 33 miles from Los Angeles, Cal., by the Los Angeles Times. The first issue, dated March 25th, is in the shape of a three-column folio, the exact size of the pages being 11 by eight inches. 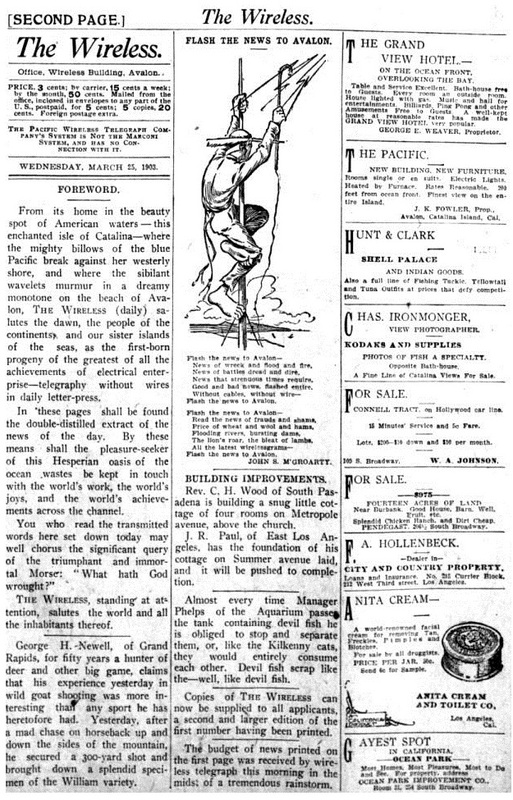 Later the size of the type page was increased to four columns. The system of space telegraphy employed in transmitting the news is owned by the Pacific Wireless Telegraph Company, of which Gen. A. L. New of Denver, Colo. is president. The apparatus used is said to be entirely different from that employed by Marconi, and the practicability of the system has been demonstrated by actual use. 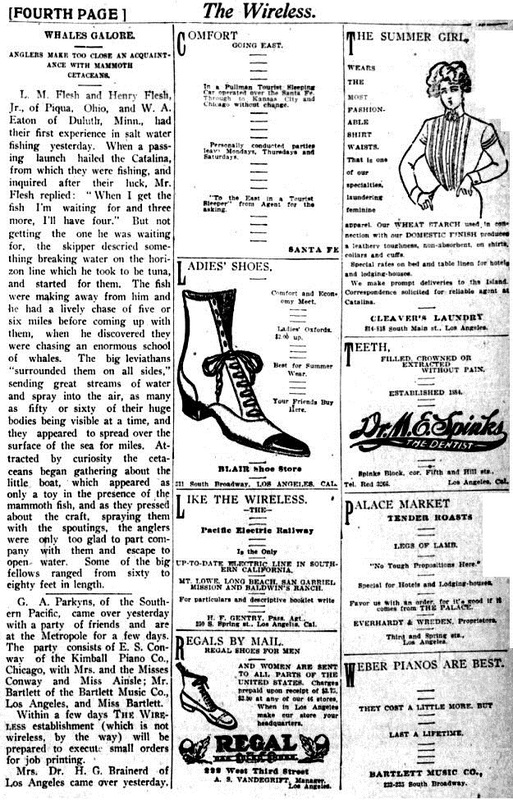 The manager of The Wireless at Avalon is S. J. Mathes, one of the founders of the Los Angeles Times. Santa Catalina Island lies in the Pacific Ocean off the coast of southern California, and is a well-known resort for pleasure seekers. Los Angeles is a few miles inland on the mainland. A summary of the Times' news is telegraphed every morning by the ordinary method to a wireless station on the coast, whence it is transmitted through the ether to the island. The Avalon editor adds his local items and gets the paper out early in the forenoon. As the island has no cable connection with the mainland, the wireless system is particularly valuable.